We’re delighted to announce a fantastic offer now available on our 2018 Bailey Unicorn Caravans. 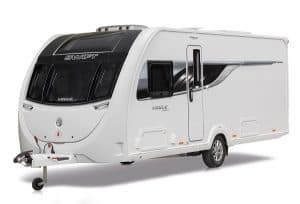 Order a Bailey Unicorn caravan before Friday 29th June and you will receive a FREE Powrtouch Classic motor mover on all single axle models (RRP £845) or a FREE Powrtouch Evolution manual engage motor mover on all twin axle models (RRP £1195). Both units will come fully fitted with a 5 year parts & labour guarantee. 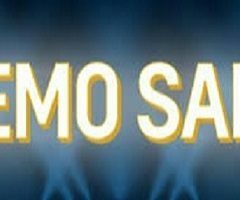 Please give our sales teams a call now for more information (Swindon 01793 772096, Oxford 01844 339566, Reading 01189 888111). Please note that model availability is limited so please hurry to secure your order. This offer must end Friday 29th June 2018. 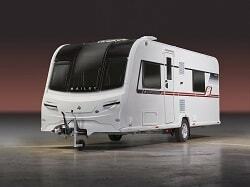 The design of the Swift Vogue is based on the award winning Swift Sprite and represents outstanding value for money. 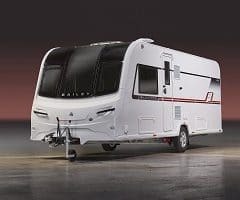 The Swift Vogue, exclusive to the Swindon Caravans Group, has 6 different layouts all of which have towing weights which are accessible to a large number of tow vehicles. 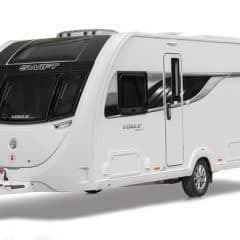 The Vogue is the same price as a standard Sprite but comes with additional exclusive features worth £2500 (over and above what the standard Sprite can offer)! Automatic trailer control, 100w solar panel, Horrex window blinds and an 230V external mains socket to name a few. 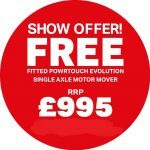 And if you order before the end of April you will qualify for a free* Powrtouch Classic motor mover worth £799 on single axle models or a Powrtouch 2 wheel drive Evolution manual motor mover worth £1195. The motor mover will come fully fitted and will include a 5 years parts and labour guarantee. 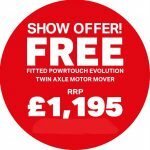 *£300 extra for a twin axle motor mover. 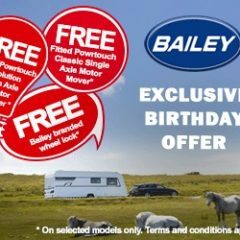 Celebrate Bailey’s 70th Birthday with a Free Powrtouch Motor Mover! 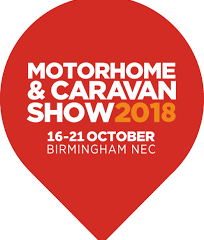 We’re delighted to announce a fantastic offer now available on our 2018 Bailey Caravans. 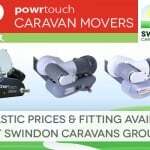 Order a Bailey Unicorn or Pegasus caravan before Thursday 29th March and you will receive a FREE Powrtouch Classic motor mover on all single axle models (RRP £799) or a FREE Powrtouch Evolution manual engage motor mover on all twin axle models (RRP £1195). Both units will come fully fitted with a 5 year parts & labour guarantee. If you order a 2018 Bailey Pursuit then you will receive a FREE Nemesis wheel lock (RRP £130). 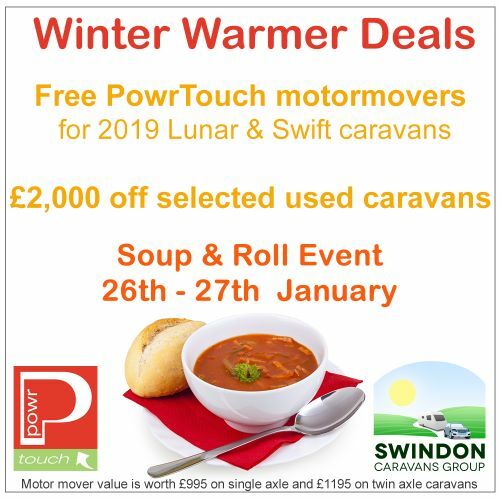 Please give our sales teams a call now for more information and model availability (Swindon 01793 772096, Oxford 01844 339566, Reading 01189 888111). 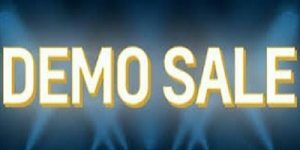 All of these offers end on Thursday 29th March 2018. 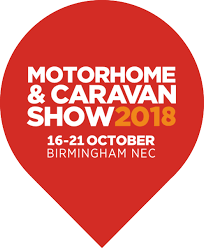 We’re delighted to announce a fantastic offer now available on our 2018 Swift Caravans. Order a Swift caravan before Sunday 25th February and you will receive a FREE Powrtouch Evolution manual engage single (RRP £995) or twin (RRP £1195) axle mover! This unit will come fully fitted and includes a 5 year parts & labour guarantee. 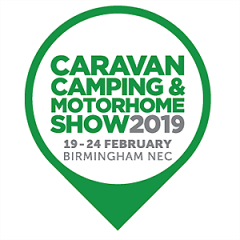 This offer is available on our very own dealer special the Swift Vogue as well as all the standard caravans in the range (Challenger, Eccles, Conqueror, Elegance & Sprite). Give our sales teams a call now for more information and model availability (Swindon 01793 772096, Oxford 01844 339566, Reading 01189 888111). 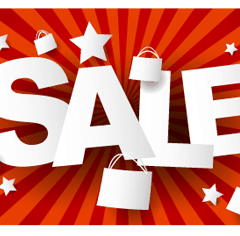 Offer ends Sunday 25th February 2018.